Forget driving to FedEx™, UPS™ or other shipping centers to get your documents notarized. Avoid the hassle of searching for parking and waiting in line. Just call 619 731-0878 and I’ll get your documents notarized quickly, allowing you to avoid the stress and hassle of those inconvenient shipping centers and brick and mortar notaries. Whether you need a power of attorney, advanced healthcare directive, living trust or any other document notarized, I have you covered. Check here for mobile notary pricing & Services. Here are some of the most common documents that need notarization. If you don’t see the document you need notarized listed above, don’t worry. If you need a San Diego mobile notary, I can help you out. Just call 619 731-0878 and your documents will be notarized quickly, for an affordable fee. The cost of your mobile notary service depends on the type of location where you would like me to meet you and how many signatures you need notarized. For example, a jail or correctional facility will cost more than a home or business, due to the time needed to check in and go through security screenings. Pricing is also based on travel distance. Check my notary pricing page for more information, or call 619 731-0878 for a quote. California has the strictest notary laws in the country, so finding a notary that is up to date on current regulations is essential to making sure your documents are notarized properly, the first time. 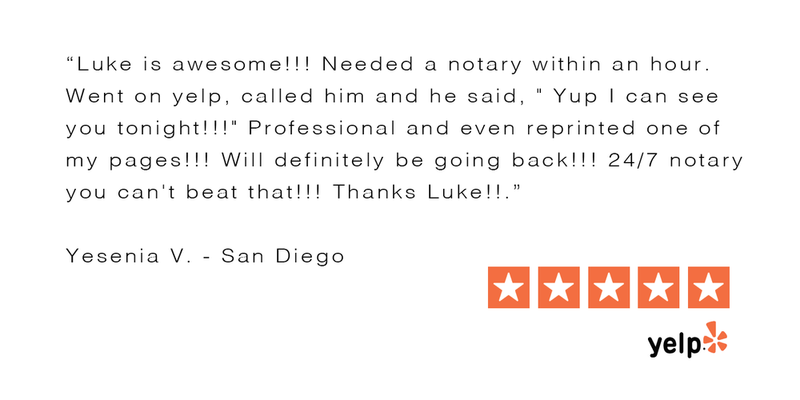 With five-star ratings on Yelp and Google, you’ll feel confident your documents will be handled properly and in compliance with California notary laws. If you’re a criminal defense attorney, family law provider, estate planner or healthcare professional, I offer convenient service at affordable rates, to save your clients time and money. If you are a contractor, car dealer or other local business that needs professional notary services, I'm here to help. Call 619 731-0878 for information on bulk discounts for businesses.